Sign in to Sigstr using Google SSO or the password you created when you initially installed. 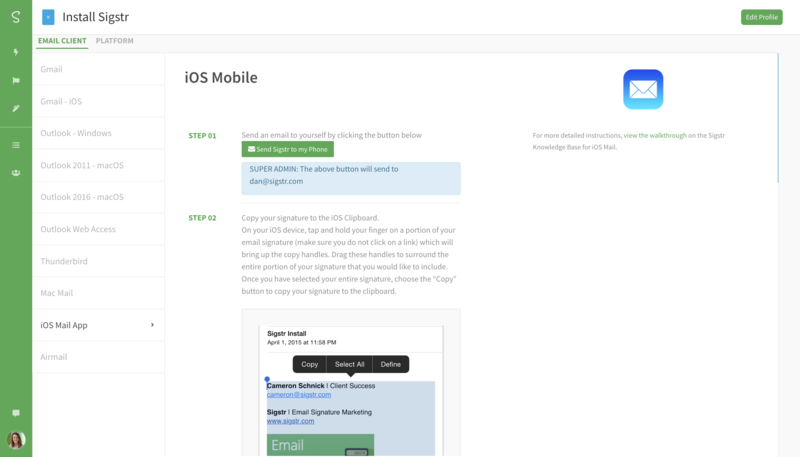 In the Sigstr application, select the iOS Mail App and then click the button Send Sigstr to my Phone. That will trigger an email to be sent to your main mail account which can be accessed via your mobile device. 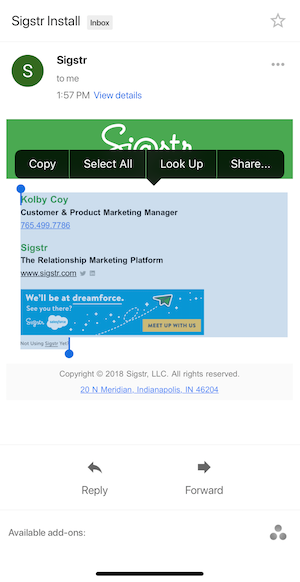 On your iOS device, open the email and then tap and hold your finger on a portion of your email signature (make sure you do not click on a link) which will bring up the copy handles. Drag these handles to surround the entire signature. Once you have selected your signature, click Copy button to copy your signature to the clipboard. Open the Settings application on your device and scroll down to Mail. Find the Signature option under composing. Click into your signature and delete any text that may be there. Once you have a blank signature, double tap the blank space and choose “Paste” from the menu. With your signature now installed, notice that the formatting is not quite right. Shake your phone to Undo Change Attributes. You're signature is now correctly installed! Head over to your mail application and send an email! After installation, if a campaign change is made in Sigstr, it will automatically be reflected in your iOS Mail App.